We felt a little guilty being down in Miami at the beginning of the month while Chicago was clocking in at -20 degrees, but the MFA and Context conferences down there each year are the places to be for a group like ours given our roles as allocators, cap intro partner for managers, and as a technology provider enabling next generation trading tools for both sides of the business. As an allocator: RCM represents a pool of HNWI, family offices, and institutional investor clients who use us to source and structure global macro and managed futures investments, using subsidiary APA to build custom multi-manager funds. We also provide the tools and knowledge to fit investments to the investor’s unique mandates and risk/return profile. As a broker: RCM works with CTAs/CPOs, hedge funds, and mutual funds to streamline operations and grow their assets under management, through strategic cap intro, multi-FCM clearing and execution, fund outsourcing, and custom risk tools and reporting. 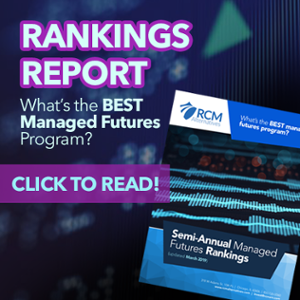 As a technology provider: subsidiary RCM-X builds futures and equity market automated execution algorithms, leveraging first-hand experience creating custom algorithms for speed and market impact sensitive traders. A mandate from a $10B+ west coast asset manager looking to have a core allocation to traditional crisis period performance type strategies with satellite strategies filing in around the edges to add returns during low vol/declining vol periods. Another from an Asian group with three separate mandates across systematic, discretionary, and options – looking to allocate $1mm per manager on the way to building a multi-manager allocation of between $50mm to $100mm. A third, using RCM to consult on building out an alternates offering for a European bank. A fourth, a family office that will seed a Tail Risk fund looking for managers with dedicated short bias during market downturns. Investor appetite, research efforts, and general interests. Coming into last year, there was a lot of interest in volatility (which, duhhh..) and investors looking to add bits and pieces of volatility as a return driver, but because of the way the stock market performed in ’18 and those rather pronounced VIX spikes, a lot of investors started looking at their portfolios trying to get a better understanding of exactly what they have in terms of equity correlation, and how to better diversify. They basically stopped seeing the benefits of diversifying, because it wasn’t performing as “promised,” and have started to consider more active diversification (actual negative correlation to stock index moves) versus the typical passive diversification alternatives have long hung their hat on (sometimes negative correlation, sometimes positive correlation). On the other hand, institutional investors are always interested in unique strategies and are consistently looking for more traders to add to their potential bench (even if the largest programs tend to be the only ones who check all the institutional due diligence boxes). And to add a twist, more of the interest is actually coming from the high net worth investors and family office side of late. They’re starting to get back in the game. But, with manager performance being not very good in general, they get to be pretty picky about who they’re willing to work with, and who they’re allocating to. The power is back in their hands. Was it an AI showcase? All we seem to hear about these days are quants and robots taking over the world, and especially in the hedge fund space. But… there were about 700 managers in attendance at MFA, and of those managers only 5% indicated that they’re using AI. Now this number may be slightly skewed because a portion of the managers that attended wouldn’t really be using AI anyways due to trading in things like real estate and loans. Now, of the active systematic traders in attendance, we definitely see more managers utilizing AI in one capacity or another than last year, and there were more that year than the previous one, and so forth. It is definitely a trend. But you need to be up on your AI terminology these days, knowing the difference between “machine learning” and AI. Most of the managers are using AI as a sort of brute force solution, essentially replicating the work of a team of analysts and having the computer identify trading patterns or ID a trade-able piece of data out of millions of data points – in near real time. We haven’t seen much in terms of machine learning, yet, where the computer is teaching itself how to find investments and acting upon those findings. Part of the job for me is getting into the mind of the allocator to find out what are the goals of the investor, and what role alternatives are going to play in the portfolio (i.e. Absolute Return or Crisis Period Performer), before then sitting with the manager to understand how they approach markets and their investment philosophy. That can get a bit tricky when assisting with a multi-manager portfolio, as you have to go deeper and further than just understanding the statistics on whether programs are correlated, and instead find what the actual return drivers of the program are, and the potential pitfalls, before aligning several together, so there isn’t an unwanted overlap in one risk area or return driver. It’s interesting to note that most portfolios used to structure alternatives to balance their equity exposure, basically, perform when the stock market is in crisis; but over the past five years, we’ve seen the space shift over from alternative investments to the absolute returns side. It’s hard to say exactly why, but my theories center around us not having seen a significant stock market or bond market decline for many years, and traditional crisis period programs haven’t really been performing since 2008 (except for one good year in 2014), so investors have been turned off to this strategy. That’s all for now. If you’re interested to hear more about some of the 30+ managers we sat down with, please call us at (855) 726-0060.